We had our firstborn son just before we turned forty years old. As older parents, we had all the “right” tests done to make sure our baby was healthy. He was beautiful! 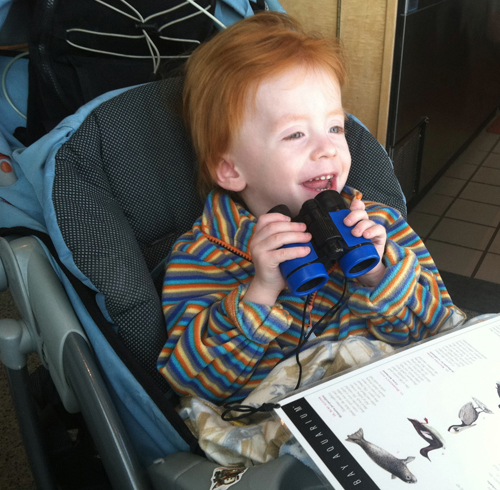 But by five months of age, Drew had been in and out of hospitals and had batteries of tests. At fifteen months of age, he was finally diagnosed with Leigh’s Syndrome, a rare mitochondrial disease. As doctors apologized to us for a positive diagnosis of a horrible disease, we refused to by beaten by the news and continued to hope. Drew had fire-red hair, light blue eyes and delicate pale skin. He had a laugh like no other I have heard. The sound he made attracted everyone, inviting them into his world. Drew couldn’t talk, sit on his own, crawl, walk, or hold his head up very well. He was tube fed all nutrition. We worked very hard to help him achieve each movement, and then one day, it would be gone. I grieved the loss of each milestone. For one month, when he was two years old, he said “momma.” It was the one word he ever had. I miss that so much I ache. Over his short life, we took Drew with us rock climbing, swimming in lakes and rivers and hiking. He saw wild elk, eagles and coyote. He held chicks and rabbits, went horseback riding, sledding and had a new puppy named Sophie. We tried to make sure he lived a full life. This was possible because of the support of a solid group of family and friends that love us and helped us when we couldn’t do everything ourselves. I know our family and friends will help make the world whole again. For the last few months of his life Drew battled viruses that weakened his body. He was sick again, and this time experiencing respiratory distress, but there was no reason to expect that he wouldn’t fight through it. But on September 9, 2011, Drew Akerstrom Mussey lost his battle with mitochondrial disease and passed away peacefully in his sleep. Hiking, climbing to meet new heights. But you my son, Drew me near.